Set wok over medium-high heat and add grapeseed and sesame oils, garlic, ginger, and red pepper flakes if using. Cook until fragrant. Add onions and toss into the flavored oil for two minutes. If using the bok choi stems, add them at this point to the wok. In the meantime, steam in the microwave the edamame for two minutes and set aside. 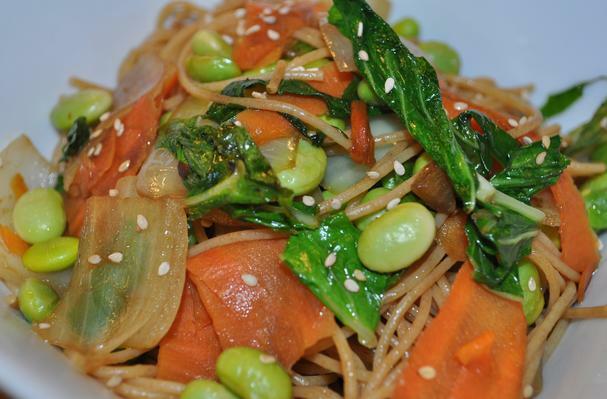 Toss the thin spaghetti with the vegetables, adding the sesame seeds, extra soy sauce and sesame oil to taste.